We plugged golf legend Moe Norman’s swing into a shot tracer app. The results were amazing. Only two golfers in the history of the game ever owned their swings, according to Tiger Woods: Ben Hogan and Moe Norman. The former is an icon within the sport and beyond. Golfers pour over the countless hours of footage we have of his swing and design philosophies around his methods. His road to the top was a long one, but once he got there, his success was achieved in the spotlight — and he's one of golf's legends because of it. Moe Norman took a different path. Moe struggled to fit in socially and many today believe he may have been autistic. He spent one season on the PGA Tour but felt unwelcome, so he returned to his native Canada, where he went on to win 55 times on the Canadian Tour, made 17 holes-in-one, and shot 59 three different times. 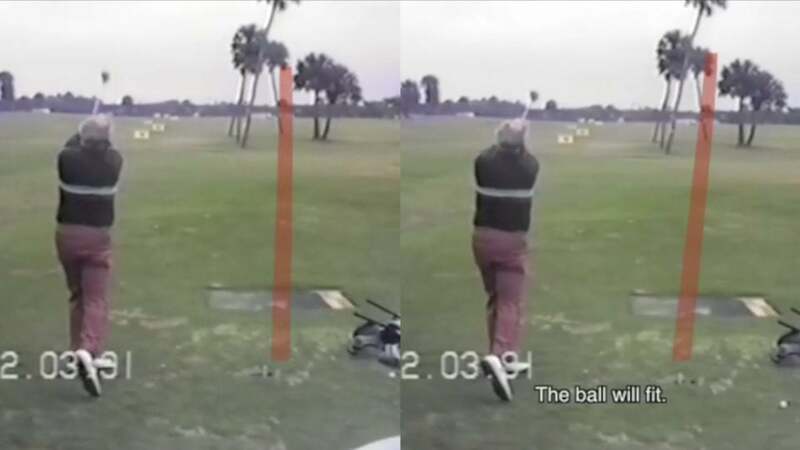 He dropped out of the limelight for years but resurfaced in the late 1980s in his 60s, where he traveled around the country putting on a series of ball-striking clinics. So, with the meat of the PGA Tour season behind us, we decided to have a bit of fun: We took a handful of Moe Norman's swings and plugged them into the Shot Tracer App. The results, obviously, won't be perfect, but they do provide a fun and new glimpse at one of the best ball-strikers -- if not the best -- in the history of the game. Here's Moe hitting a baby fade. Which he followed by hitting a little draw. Then he decided to hit a few dead straight. I called up instructor Todd Graves, founder of the Graves Golf Academy and a former mentee of Norman's who designed his "Single Plane Golf Swing" philosophy around Norman's technique. Graves witnessed Moe's ball-flight in-person over the course of many years, including more than 70 ball-striking clinics. He helped us improve the accuracy of these videos by providing us detail about Moe's trajectory, swing speed and distance, while also explaining how his unique technique helped him hit the ball so straight. "The first time I ever saw Moe hit balls in person, he started hitting these little wedges. The first three hit this sign he was aiming for, and the fourth rolled just under it," Graves said. "He would push or pull shots by a few yards every now again, but the contact was so clean...he was hitting these little bullets, the ball just wasn't moving." How did it he do it? It's all in his mechanics, Graves says. "The problem is that many players have so many movements and rotations in their swing, which makes them very reliant on timing," he says. "Moe's swing relied on very simple basics. The way he hit it consistently because he made it very easy for himself to get back to impact." YOUR TAKEAWAY? If you're struggling with consistency from tee to green, take a page from Moe's book. Step back, evaluate, and consider simplifying as many of the movements in your golf swing as possible.